So far AIU has provided assistance with foreign language learning at LDIC and one-on-one instruction at AAC (Academic Achievement Center). 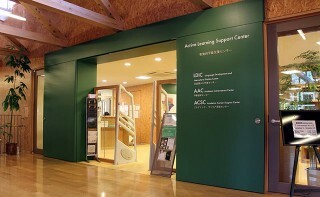 In addition, the ACSC (Academic Career Support Center) was created to provide support for students aiming to pursue further studies at our graduate school. 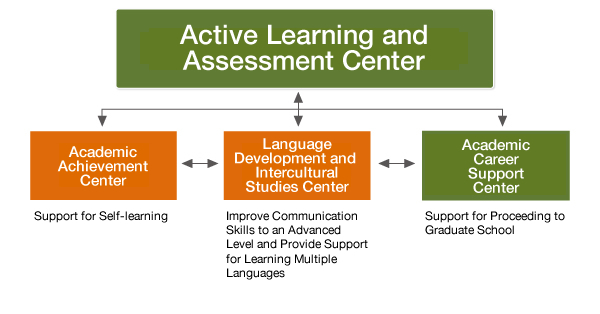 Collectively called “Active Learning Support Center,” the three centers support students in their self- and active learning, playing a role in shifting our university from a teaching-centered to a learning-centered environment. Teaching Assistants (graduate students) and Peer Tutors (undergraduate students) who have completed training by faculty coordinators offer private tutoring in fundamental English, mathematics and Japanese language subjects (for international students). Teaching Assistants also provide assistance with academic writing to further improve students’ English communication skills. In order to provide support for students’ self- and active learning in foreign languages, LDIC (Language Development and Intercultural Studies Center) offers a wide variety of learning materials in many different languages, an open space, and individual and group study rooms. In addition to the services that have been provided so far, LDIC now offers opportunities to learn advanced subjects related to English language teaching, such as debate, presentations and negotiation. The ACSC provides information on graduate schools in Japan, abroad and also offers guidance on how to prepare for postgraduate entrance exams such as the GRE and GMAT. Furthermore, the center analyzes data regarding the educational effects of universities.